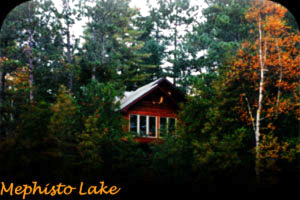 Mephisto Lake - Cottage & B.B. - About the Cottage & B.B. This unique lakefront cottage is secluded & nestled in the pines. Located 40 minutes South East of Bancroft and enroute to beautiful Algonquin Park. Its Western exposure offers magnificent sunsets, peace & tranquility, second to none. 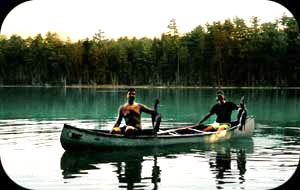 It is situated in the center of thousands of acres of Crown land on a chain of 5 crystal clear spring fed lakes, linked by miles of beautiful rivers offering the best canoeing, boating and fishing in the north. The beauty of Mephisto Lake, is largely undiscovered and begs to be explored by visitors looking for a memorable getaway and a truly Canadian experience. Notwithstanding, The beautiful waterways, the trails of Bancroft District and the network of forest access roads running through crown land, have much to offer to the A.T.V’ers, hikers and riders. Craggy hilltops and low marshlands offer spectacular scenery with varied and interesting terrain. Opportunities to see wildlife are at its best.